Trends plays a very important part in SCADA application as they give us a graphical representation of our Tags over time. Trends can be of two types i.e Real and Historical. We will not discuss much about trends here as we have already told about Types of Trends in SCADA System. 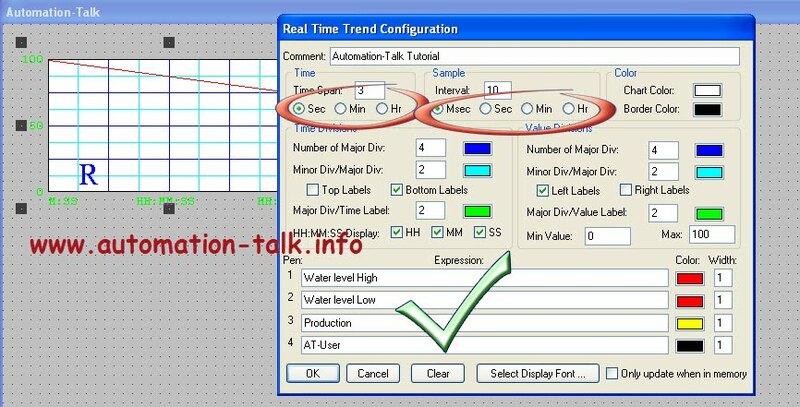 In this article we will only tell you how to configure Real time trend in Wonderware Intouch SCADA. Subscribe to Automation-Talk by Email. Real-time trends allow you to chart up to four pens (data values) in Intouch SCADA and are dynamic. They are updated continuously during run time. 1. Open your Intouch and make a Project or you can edit your existing project also. 2.Now click on Real-Time trend button as shown and then drag the mouse diagonally to draw a rectangle the size that you want your trend to be. 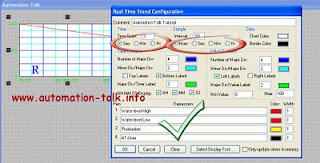 4.Double-click the trend to open its configuration dialog box. 5.In the Time Span box, type length of time you want to display horizontally (x-axis) on the trend then select time increment option for the length of time. 6.In the Sample Interval box, type the frequency at which the trend expression will be evaluated and the chart updated, then select the option for the time increment to which the number will relate. 7. There are other options like Color, Time Division, Value division etc. fill them according to your application or keep them as default. 8. Now in the PEN Section put the Tag name for which you want to see the real time Trend. 9. Click on OK and run the application. Note: Please make your Tag name first though you can make your Tag-Name also at the time of configuring Real Time Trend. Will post more tutorial on Intouch SCADA till then Subscribe to Automation-Talk by Email.